Although I had initially planned to post another reflection about faith today, I decided against it because spiritual meditations are best taken a little at a time. Rather than overwhelm my dear readers with too much introspection, I’ve decided instead to save it for another day and write about That Time I Was a Blacksmith. As the spring 2010 semester drew to a close at Bethel College, I made plans to work as a painter for the college’s maintenance department over the summer. I’d worked there during the previous two summers and felt confident I’d be hired. I was wrong. The maintenance department didn’t hire any student workers due to budget issues. I had four months before me and no job, no salary and no plans. Then my sister-in-law’s parents contacted me. Her father is a blacksmith—a genuine, honest-to-goodness professional blacksmith, one of those mighty men who craft things out of iron and steel. They had heard from their daughter that I was looking for a job. Would I be interested in working for them over the summer? I packed up my things and moved into their home for about two and half months. (I spent the last month of that summer teaching English in South Korea, but that’s another story for another post.) When I went to stay with my sister-in-law’s parents, I didn’t know much about blacksmithing. Here are a few of the things I learned. Blacksmithing requires considerable physical fitness and strength. Whatever else I may be, I’m not physically fit or strong. I generally used the smallest hammer in the shop. My brother calls it “the girly hammer” because it was the tool his wife and her sisters used when they worked as blacksmiths. It’s a little embarrassing to admit, but they were all much better blacksmiths than me. 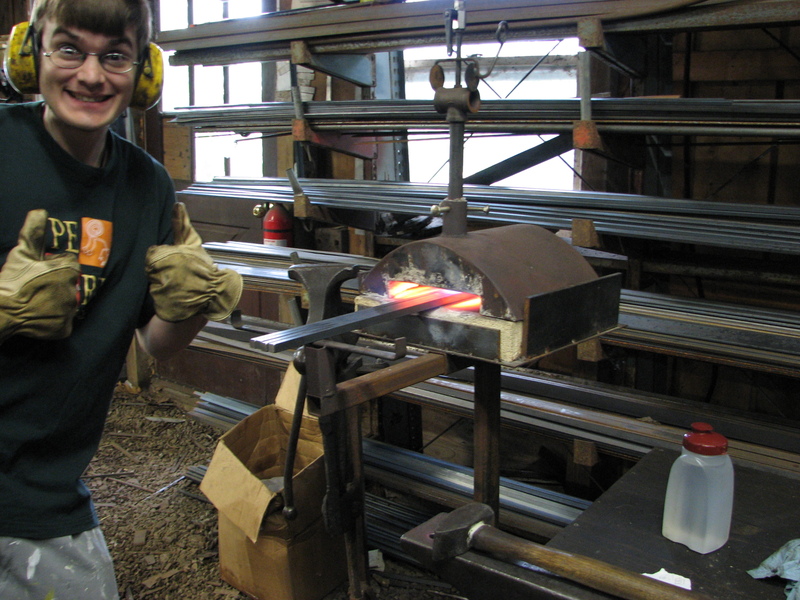 When I began working as a blacksmith, I had great ambitions to make an epic sword. It didn’t have to be a Buster Sword or even an Andúril. I simply happen to have a passion for sharp objects and wanted to make a sword that was uniquely mine. I was disappointed to learn that crafting swords is a career of its own. Which brings us to the next thing I learned. I had just assumed blacksmiths made everything. Only after I began working did I realize there are knifesmiths, who make knives; swordsmiths, who make swords; farriers, who make horseshoes; and standard blacksmiths, who make miscellaneous items such as candlesticks and tent pegs and barbecue grills. My boss fit into the last category. I would never have guessed it, but there’s much more to being a blacksmith than whacking things with hammers. A blacksmith must figure out how many two-and-three-quarter-inch lengths can be cut from a twenty-foot steel rod, and how many corresponding one-and-a-half inch lengths must be cut from a fifteen-foot steel bar. There are angles to be calculated and numbers to be added. This was a problem for me. I’m an English major, you see. Having assumed the math skills I picked up in high school were mostly useless, it was quite a shock to realize mathematics does have practical applications after all. In the movies you see old-fashioned smiths banging away with hammers and pumping air into coal fires. In these high-tech days blacksmiths use propane-fueled forges, power hammers and electric saws. It was quite a surprise to walk into the shop and find antique anvils (my boss has anvils that are centuries old) sharing space with heavy machinery. Apart from working in the shop, I also had the opportunity to accompany my boss to several rendezvous—reenactments of early nineteenth-century America. We set up a tent full of merchandise and spent whole weekends forging and selling items. My boss did the forging, hammering red-hot metal in front of a blazing coal fire in the summer heat for hours on end. It never seemed to bother him. I had the easy job of sitting on a stool and taking our customers’ money, and I still felt tired at the end of the day. I met a lot of neat people at those rendezvous. A man who looked like a homeless person with a greasy beard and stained T-shirt turned out to be a professional swordsmith with multiple university degrees. Another man was the exact image of Benjamin Franklin. And at my first rendezvous, my boss and I stood in line for supper with folks dressed like people from different epochs of Earth’s history: ancient Romans, medieval knights, French noblemen and American colonialists. We did not merely stand in a line that night. We stood in a timeline. I don’t plan on ever becoming a blacksmith again, but it was a very good experience. My boss and his wife were ridiculously kind, generous and hospitable. My boss was also very patient. A lesser man would probably have lost his temper and bashed in my head with a hammer, but he was always tolerant of my mistakes. My only real regret is that I wasn’t able to make that sword. This entry was posted in Life, the Universe, and Everything and tagged college, That Time I _____ by Adam Stück. Bookmark the permalink.